Can I delete the older version of Affixa in the G Suite Admin Console "Marketplace Apps" list? I'm busy right now - what if I forget to switch? "Sorry, we weren't able to log you in"
there's nothing additional to pay. For Affixa Enterprise to create drafts or send messages on your behalf, is uses "APIs" provided by Google. APIs allow different pieces of software to work together to accomplish a goal. One of those APIs is being retired in the final quarter of 2018 so we need to start using a different API. However, we can't just start using that replacement API; we need to ask for your permission to use it. We currently use Google's Email Settings API to retrieve your users' email signatures. That's being retired during the fourth quarter of 2018 and we need to start using the Gmail API instead. We already use the Gmail API to create draft messages and send messages on your behalf, but that's all we have permission to do right now. To be able to retrieve your users' email signatures, we need an additional permission. You'll need to log into our Portal as a user that's both an Affixa admin and a G Suite admin. If you don't currently have a user that meets both requirements, any Affixa admin can add a G Suite administrator as an Affixa admin from the Users page inside the Portal. Click the "Integrate with Google" button and accept all the permissions requests that appear. You'll also be told that some additional configuration is required; click the link to begin this. You'll receive a confirmation screen that you've been upgraded and you'll then need to log in again. That should be it! You don't need to set anything up again; all your settings, users and domains should be carried over without you doing anything. Can I delete the older version of Affixa in the G Suite Admin Console marketplace apps list? Once you've switched over, you can safely delete the older version from your Admin console without impacting the new version (so don't worry about the warnings you're given by Google). Just be sure you're deleting Affixa Enterprise (the old version); not Affixa Enterprise for G Suite! We've put steps in place so that your users shouldn't be too inconvenienced if you don't manage to make the switch before the end of September. However, the best we'll be able to do is use older copies of email signatures saved from the last time your users ran Affixa before the end of September. If you were to change your email signature in Gmail or the G Suite Admin console from October onward, we wouldn't be able to pick up the changes and you'd still get the older signature in any messages created or sent via Affixa. you've probably not completed all the setup steps above. 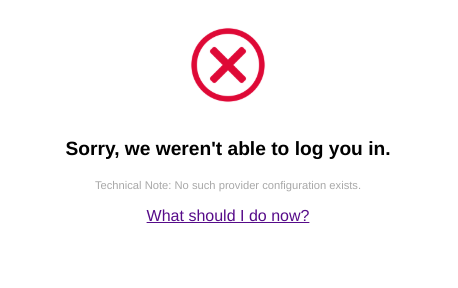 Don't worry - it's easily fixed and your users should still be able to use Affixa OK.
To resolve this, log out of our Portal and then back in again. If you're struggling to log out or in, try this link: https://apps.affixa.com/account/logoff . 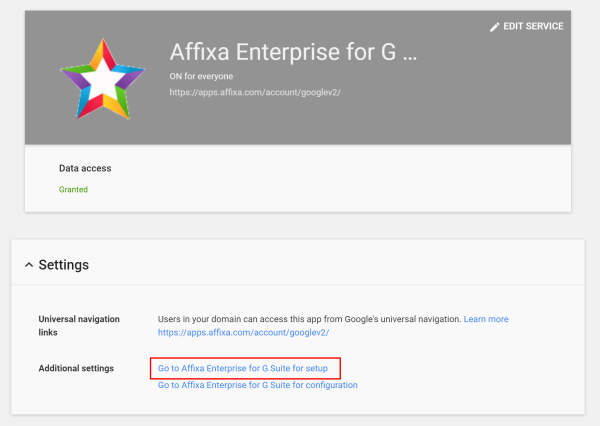 Under Settings, click "Go to Affixa Enterprise for G Suite for setup" and it should complete the upgrade for you. No problem - just click the "Contact" link below to get in touch.